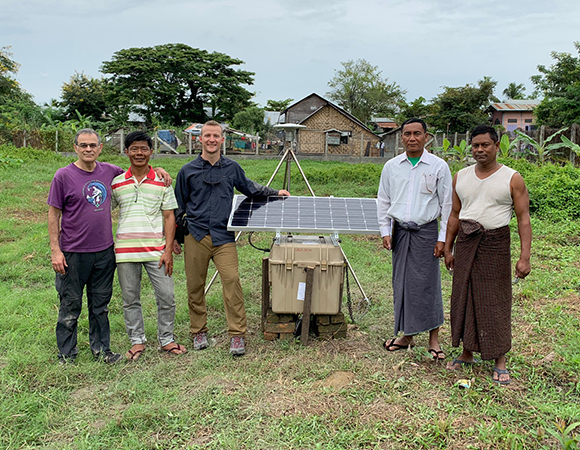 Continuing previous work in Bangladesh, Michael Steckler (LDEO) and Keith Williams (UNAVCO) arrived back in Myanmar in late October of 2018 to begin the installation of five additional cGPS sites with collaborators. 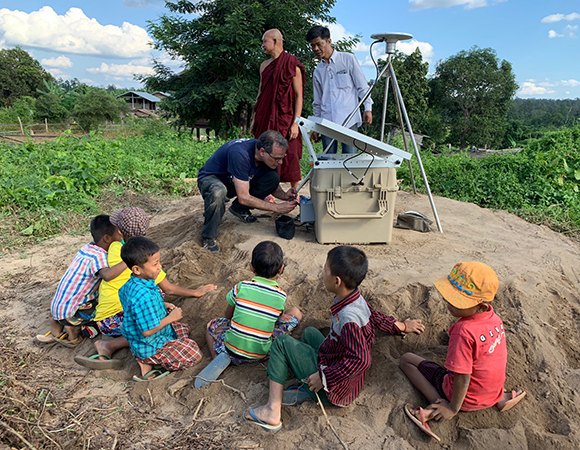 The larger project entails installation of a transect of cGPS stations and seismometers spanning Bangladesh, India, and Myanmar (see previous Tripartite Highlight). The five stations were installed successfully over 11 days. New stations include KALW, KLAY, TEDM, THKG, and THKK. 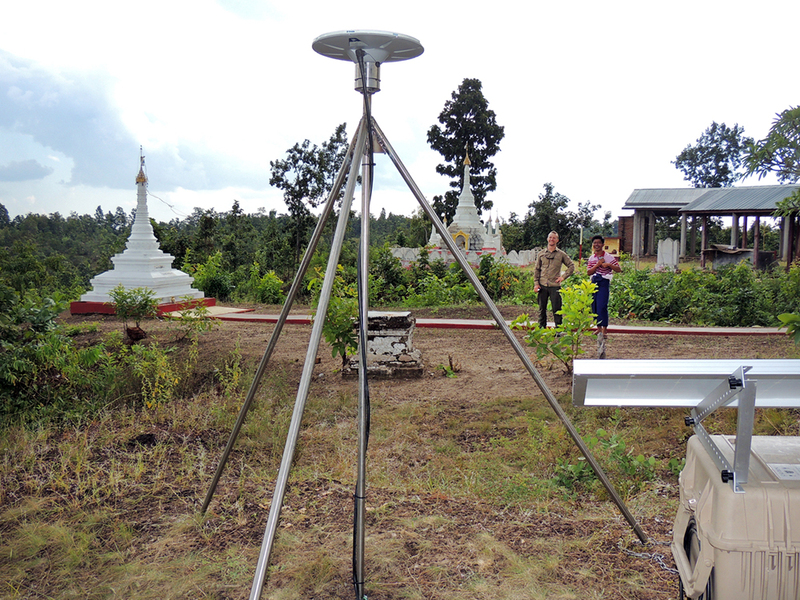 Each station is comprised of a Trimble NetR9 receiver and Trimble Zephyr Geodetic 3 antenna, on a pounded shallow braced monument. Data will be available via the UNAVCO Data Archive after a two-year exclusivity period for project investigators. 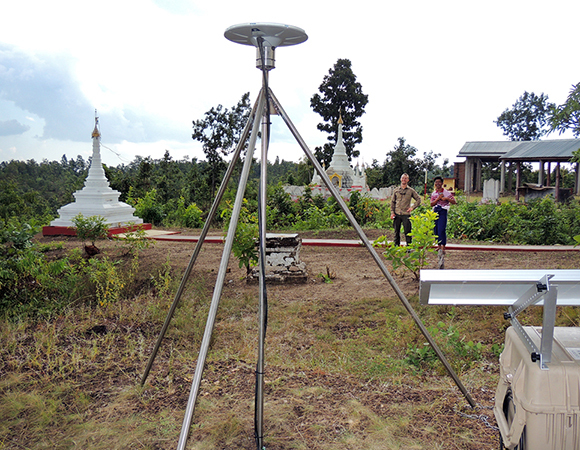 The team’s arrival was on the last day of the Thadingyut Festival, which is a public holiday; the Department of Meteorology and Hydrology (DMH) offices, where project collaborators are based and project equipment was stored, were closed. 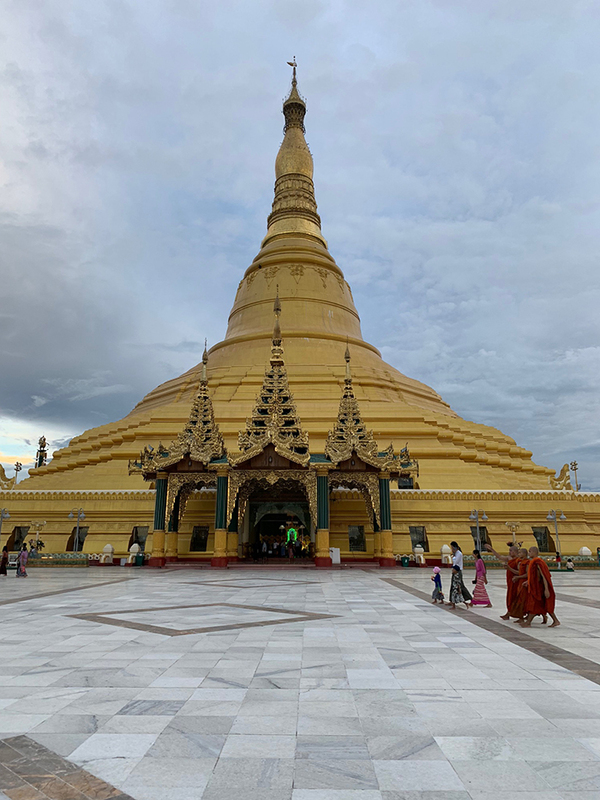 This allowed Keith and Mike a little rest after the long flights to Myanmar, the opportunity to acquire hardware for installs from shops that remained open, and a visit to the 325 ft tall Uppātasanti Pagoda in Naypyidaw that was finished in March of 2009 (Figure 2). The following day the work began. 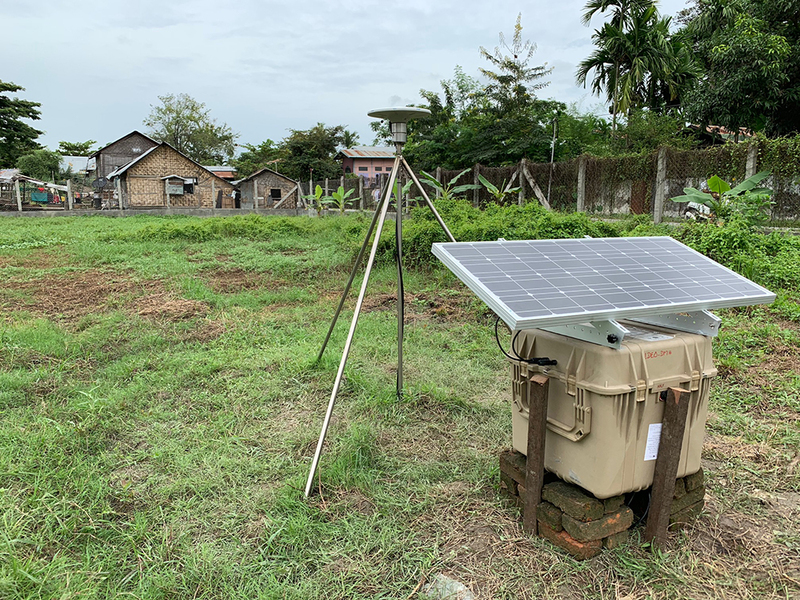 Most of the equipment (12-ft stainless steel rods, batteries, and generator) were sent by bus to Kalay to the local DMH office, which was to be the central hub for the station installs. 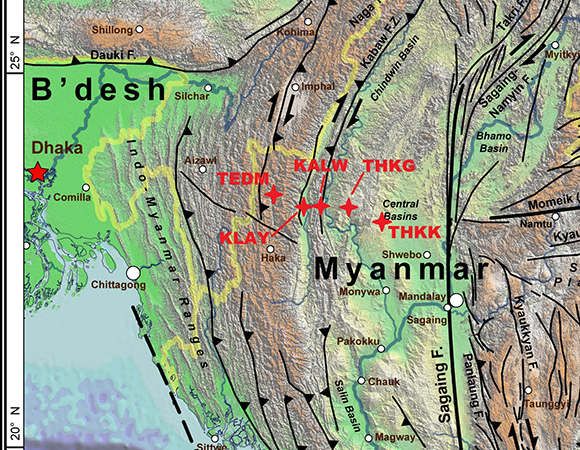 Kalay was also the location of the first site, which went in with no troubles (Figures 1 and 3). 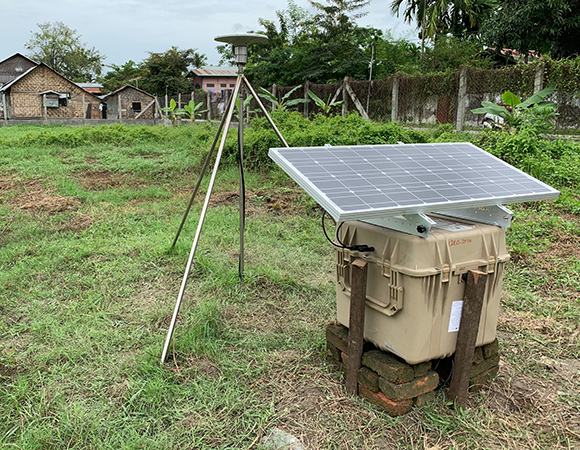 After that install, however, weather modified the group’s plans and they traveled east to Kalewa to avoid rain while traveling up the steep mountain road in the west. Kalewa proved to be the most troublesome site. 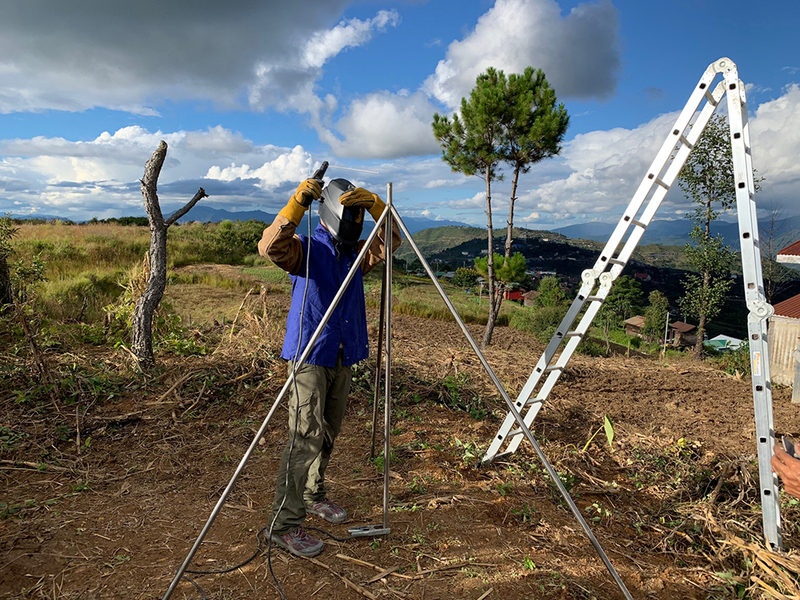 Five people took turns pounding the stainless steel rods for the GNSS monument into hard ground, with each blow only gaining about 1-2mm of penetration. 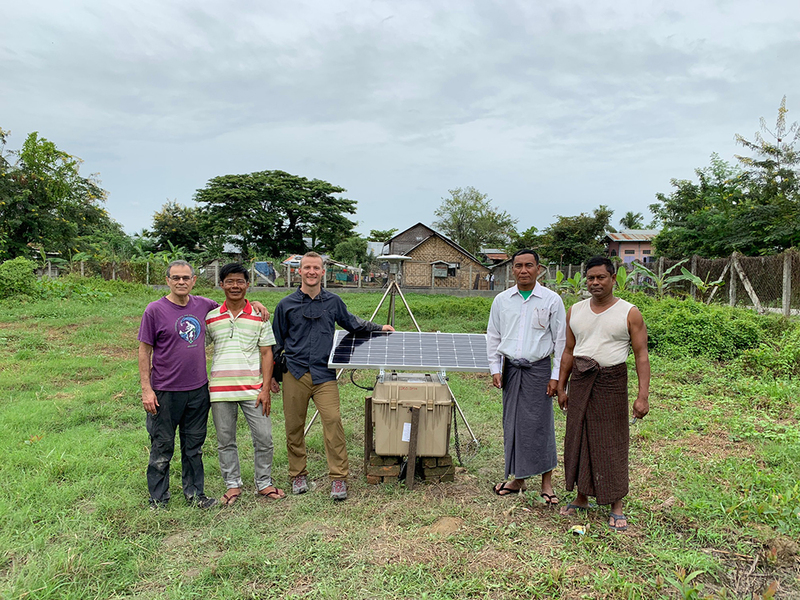 The Kalewa install was finished just after sunset, and the team drove the 1.5 hours back to Kalay that night to restock for the trip west. 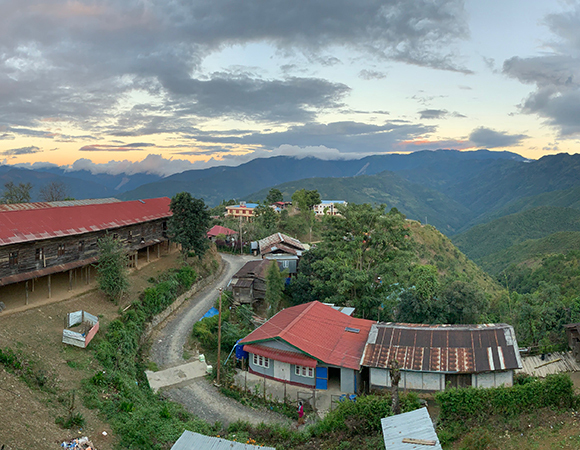 The next site, Tedim, was a 3.5-hour drive through the Chin Hills climbing to over 2000 m elevation. Work began on an install at the local DMH office after the group found a hotel and some lunch. 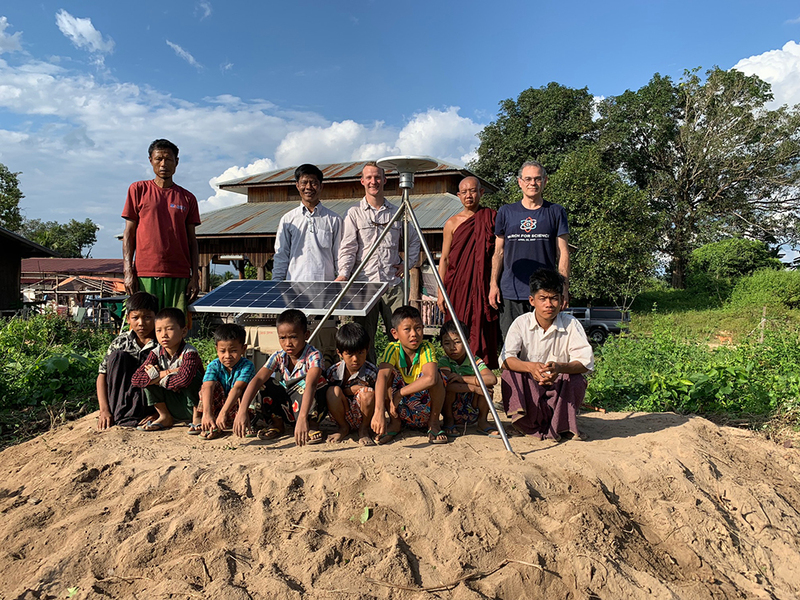 The sun set with about an hour of work remaining, so the crew finished quickly the next morning before driving back to Kalay to again restock, for the last two sites. 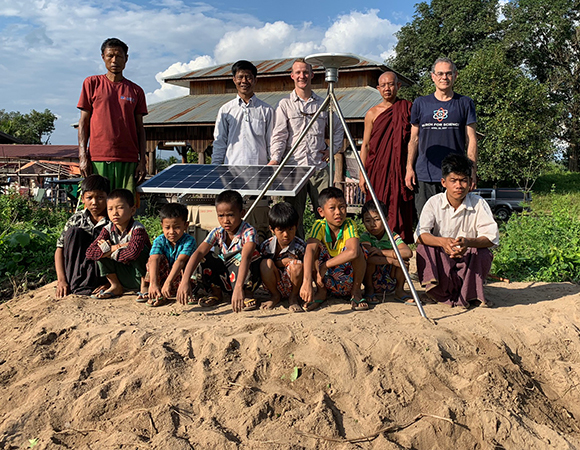 After a three-hour drive east to a monastery in Thickegyin, the team sat down with the head monk to obtain permission to install the site. Thickegyin was the antedote to the challenging and tiring install at Kalewa; the substrate in around the area was of a beach sand consistency. 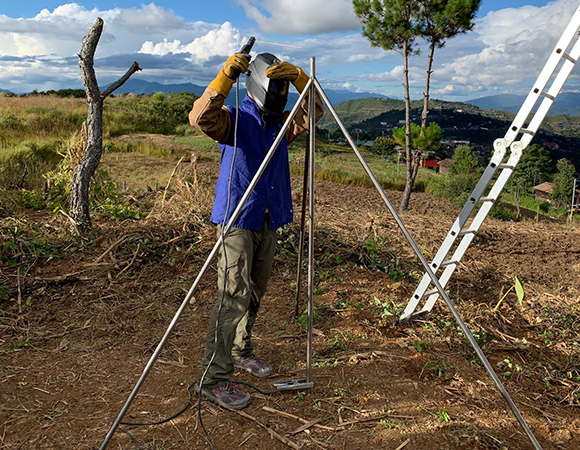 The stainless steel monument rods were able to be pushed into the ground by hand, with only a foot or two’s worth of light pounding to get them to the height desired for the monument. With the Thickegyin station installed, the team continued further east over poor roads, finally arriving in Taze where they spent the night. 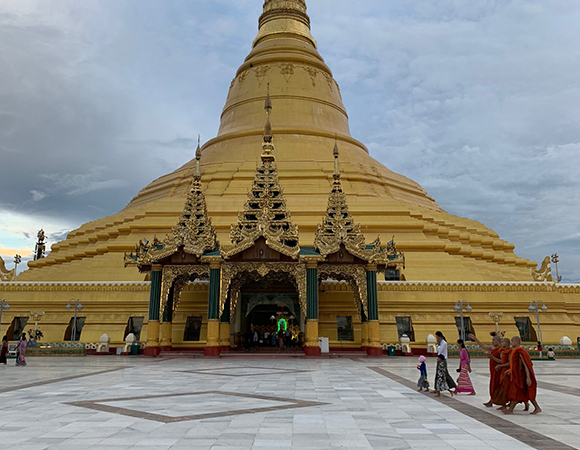 The last site was at a monastery overlooking the Irrawaddy Valley; after coffee, tea, and snacks with the monks they installed the site and began the two-day drive back to Naypyidaw, having completed the five installs. 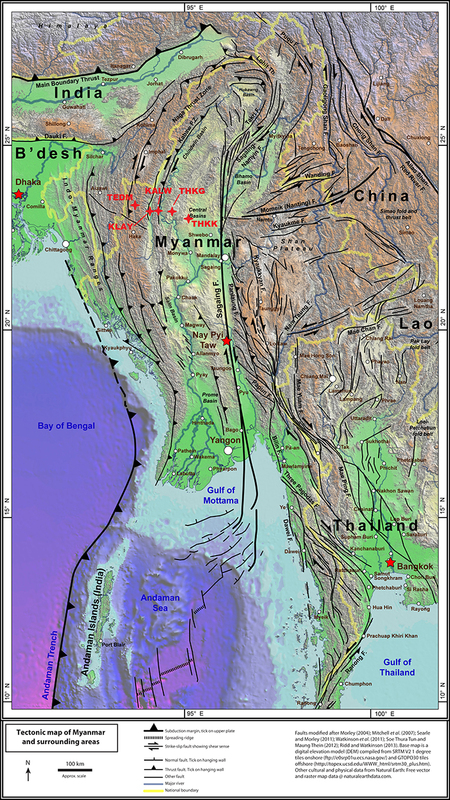 This trip completes the multi-year, multi-country GPS transect project installation.